8K is clearly sharper than 4K on a 70-inch TV, says DP Phil Holland. 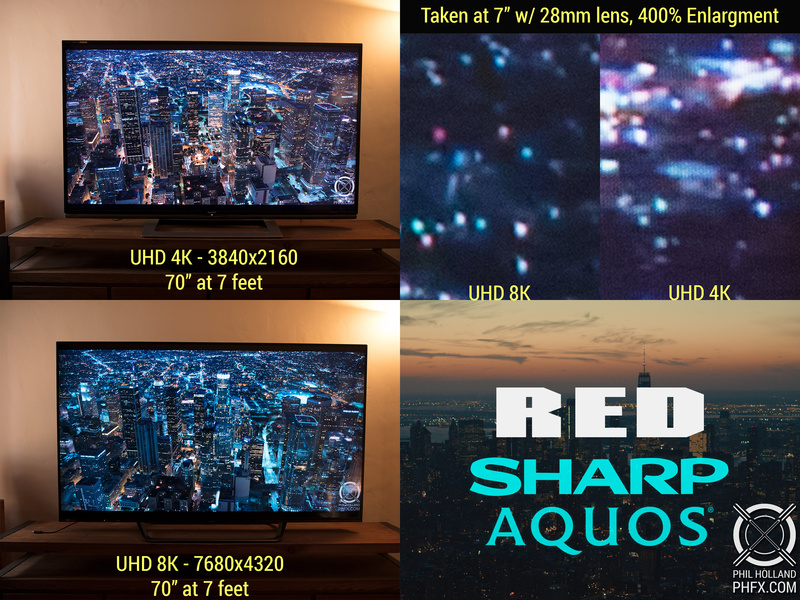 RED hasn't confirmed the exact nature of the project with Sharp, or whether they're actually working on a consumer 8K TV together. However, it makes a lot of sense for RED to be boosting 8K tech, as it sells the 8K Weapon camera with both Super 35 and Vista Vision sensors. It also plans to release cheaper 8K cameras in partnership with Foxconn, according to a rumor from Nikkei. It's pretty darn hard for filmmakers and post-production facilities to find, let alone buy, 8K televisions or monitors. Companies like Panasonic, Sony and LG have all flaunted 8K TVs, but none are coming to the US anytime soon. Sharp itself is now selling 70-inch 8K TVs in Asia, and will soon bring them to Europe, but has no plans to release them in the US anytime soon, as far as we know. Holland told Engadget that the 8K prototype TV requires four HDMI cables, and that you need really good quality 8K footage to appreciate it. He notes that the 8K set can upscale 4K footage, but the difference between that and true 8K is "pretty clear." He took closeup shots of both the 4K and 8K screens, with the latter appearing to have superior sharpness. The TV, he adds, is a "special project between RED and Sharp." There's not even much 4K content yet, and most consumers still haven't switched from HD, so 8K is far from going mainstream. You'll likely see it in theaters well before it arrives to TVs, much like what happened with 4K. However, 8K is going to get a lot more attention in 2020 in Tokyo, because host broadcaster NHK plans to use the Olympics to showcase the new standard.